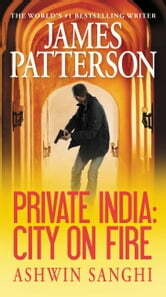 When Jack Morgan opens the Mumbai branch of Private, the world's most elite detective agency, he hands the reins to top agent Santosh Wagh. Now, in this teeming metropolis of over thirteen million people where the guilty have everywhere to hide, Santosh goes on the hunt for one elusive killer: a killer who is targeting seemingly unconnected women and placing strange objects at their death scenes in a series of chilling rituals. This is the worst James Patterson book I have ever read. Very difficult to follow and hard to get into. This book had a few twists and turns. You didn't know where it was going. And the ending left it up in the air. Boring beyond words I could not turn the pages fast enough..... whole barely reading them. Do not.... I repeat..... do not spend money on this book. Mt. Patterson , you are ruining your reputation. I will no longer "blanket recommend" your books. You have fallen a long ways since your earlier books where YOU did the story telling and kept me intrigued from start to finish. I think it is time for you to take a long hard look in the mirror. Sad to say this was a great disappointment. Shall not buy any more james patterson books. Just not up to his previous standards. Don't know if it is the two writers together but definitely not a page turner unless you want to get to the end quickly. Lots of twists and turns keeps you thinking, wondering and guessing right till the last page. Could not put it down.